I always assumed "teamwork" meant "don't actively hunt and kill the people on my squad". Anything more than that - like some semblance of community or co-ordination - was just a happy accident. So seeing ShackTactical's Andrew " Dslyecxi " Gluck explain how to effectively create a symbiotic relationship with the rest of your team is something of an eye-opener. Communication? Awareness? Not firing randomly while spinning around, jumping wildly and shouting "BULLET-COPTER"? Whoever would have thought? 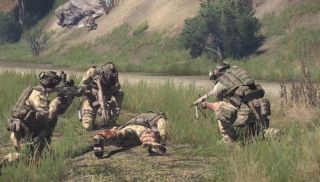 This is the third Bohemia licensed community video, designed to help Arma newbies make a smoother transition into the world of military simming. If you missed them, you'll find the first two parts below.